We Have Dance Parties ! And GROUP CLASSES Once or Twice a Week. We Meet Outside the Studio ! We Attend Dances & Fund Raising Events. Locally & Natioanlly With Amazing Results. WE MOVED!!!! Dance Alday has a new home. Same shopping center at Shoppes of Veranda, where Pussers, and Ruth's Chris are located. We are just moving at the back courtyard, walkway to the right of Island Girl Bar. We are in Suite W19, next to Meridian Fitness. Friday, March 1, 2019, @ 8:15. SWING Group Class prior at 7:30. DANCE ALDAY offers the best quality of ballroom and latin dance instructions in Ponte Vedra Beach. With over 40 years of combined teaching experience, our knowledgeable instructors will guide you from your very first step, to becoming a confident dance partner, and all the way to becoming a Champion. Whether you're coming alone or with a partner, young or young-at-heart, social dancer or competitive dancer, you will have fun learning with our amazing staff and learn to dance with confidence. COUNTRY & WESTERN dances: Two Step, Country Waltz, ChaCha, Polka, and LINE DANCING. We hope you can find everything you need here. We are focused on providing high-quality dance instructions and customer satisfaction - we will do everything we can to meet your expectations. With a variety of offerings to choose from, we're sure you'll be happy learning to dance with us. Look around our website and if you have any comments or questions, please feel free to contact us. Private lessons are the foundation of our teaching system and where you learn HOW to dance. Similar to golf, tennis, music, etc., private lessons are all about the right information at the right time for the individual. Because we are responsible for your progress, private lessons relieve you of the stress of having to perform while learning. Specially for the person who is leading. This is how beginner dancers need to start to becoming more confident and more comfortable with any dance partner on the dance floor. You’ll have your own instructor to guide you through your dance journey. You'll become familiar with additional dances and steps at Dance Alday's group classes, which is available right before our Practice Parties. Please check our calendar and our NEWS FLASH section, for the dances and dates. You will get a chance to dance with fellow dance members and an instructor by switching partners during the classes. We offer PERSONALIZED group classes. Bring your friends and family and we’ll customize a group class to your needs. Group classes challenge you to do your steps on your own, or with a partner, which also increases your confidence in dancing. Dancing is like a language, and club parties are where you will learn to converse with ease. 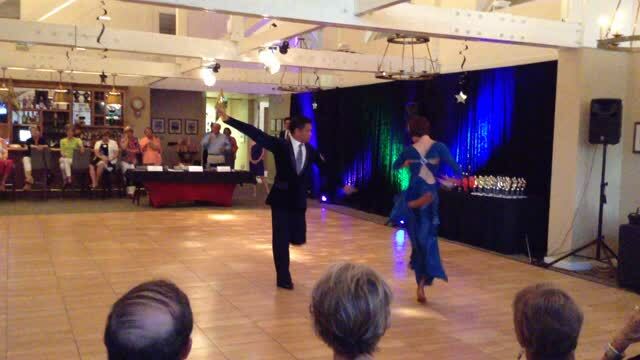 Dance Alday hosts ballroom dance parties once or twice a month, featuring a variety of dances and music. Ballroom dance parties are a wonderful way to make new friends and enjoy dancing with your fellow studio members and dance instructors. In a controlled and friendly setting, you will gain greater confidence to use your dancing more fluently. Muscle memory is more important than mental memory, in any language learning. You will need actual dance experience to get ready for that night on the town, or for that special occasion.